Speaking after his perfect game bid for Double-A Harrisburg on Wednesday, No. 4 Nationals prospect Wil Crowe provided a revealing sentiment about how the first week of the Minor League season feels to some players. "After the first one, it was good to have that one out of the way," he said. "It kind of broke the streak, I guess. Now, it's back to business." The 24-year-old right-hander is back with the Senators to open 2019 after making five starts for them last season. They weren't particularly memorable ones. He went 0-5 and finished with a 6.15 ERA, walking more batters (16) than he struck out (15) over 26 1/3 innings, and averaged almost two baserunners per frame. All of this was uncharacteristic for the 2017 second-rounder, who has three above-average pitches in his fastball, curve and changeup. Because of the nature of the late-season callup, that first turn in the Eastern League didn't necessarily hurt Crowe's stock, but it did place some small doubt about whether he could handle the level. Crowe has erased that already in the season's first week. He allowed just one earned run in five innings on Opening Night, and then came out and took a perfect game into the sixth Wednesday. Even if there was little worry that his stuff can play at Double-A, it's been mostly erased now, which comes as a relief to the hurler no matter how confident he was entering 2019. Many other prospects are singing the same tune these days. Below are some top prospects who ended 2018 on a sour note but have enjoyed much brighter days so far in 2019. 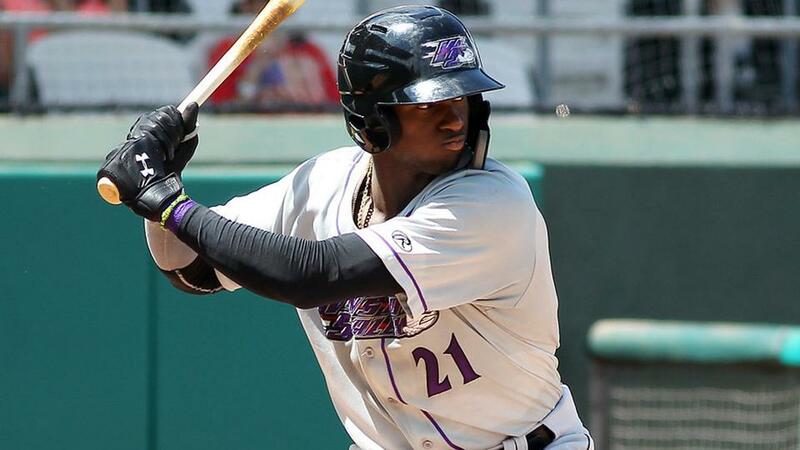 Luis Robert, White Sox outfielder, Class A Advanced Winston-Salem: The standout stat that most illustrates Robert's 2018 vs. his start to 2019? The No. 4 White Sox prospect did not homer in 140 plate appearances with Winston-Salem last season. He's gone deep five times in 34 plate appearances already in his return to the Dash. Robert has incredible potential with the bat -- it's why Chicago signed him for $26 million out of Cuba in 2017 -- but he dealt with two left-thumb injuries last season that limited his time on the field and took away some of his power. (He did show signs in the Arizona Fall League, hitting .324/.367/.432 with two homers in an 18-game turn.) Mix in the power with his plus-plus speed and good arm in the outfield, and Robert is closing in on being a five-tool threat. MLB.com's No. 39 overall prospect should climb in the rankings if he even comes close to keeping up a level of performance in which he's produced a .452/.500/1.065 line so far in the Carolina League. Heliot Ramos, Giants outfielder, Class A Advanced San Jose: Considering he was 18 for the entire 2018 season, the Giants' No. 2 prospect can be forgiven for hitting .245/.313/.396 over 124 games with Class A Augusta in his first full campaign. His 104 wRC+ ranked 32nd out of the 60 qualifiers in the South Atlantic League, and even if that's not worrisome for a young player, it's not ideal for a top-100 player. It was notable that San Francisco still pushed him to the California League, and he's responded, like Robert, by turning on the power. Ramos has six hits in his first eight games, and three of those have been homers. Yes, the Cal League is known for turning even lighter hitters into decent sluggers, but all three of those shots came in Stockton, one of the league's fairer parks. Add in two doubles, and that works out to a .654 slugging percentage. Ramos is also taking walks with six in 33 plate appearances for a 18.2 BB percentage, up from 6.5 percent last season. This is still small-sample territory, but with Ramos finding ways to reach base when he's not making contact -- and making loud contact when he is -- there are a few pleasant developments in the teenager's game. MacKenzie Gore, Padres left-handed starter, Class A Advanced Lake Elsinore: The Padres' No. 2 prospect mentioned on the Minor League podcast that this season already had a different feel to it. For one, he's fully healthy after blisters limited him to 60 2/3 innings with Class A Fort Wayne. Second, he feels the weight of great expectations has been lifted some now that he's another year removed from being the third overall pick in the 2017 Draft. One thing's the same -- the 20-year-old left-hander has tremendous potential with four above-average to plus pitches, and he's shown that already in the Cal League. Gore fanned eight and scattered four hits and a walk in five scoreless frames at Inland Empire last Friday and followed that up with five more zeros, seven strikeouts and one walk Thursday against the same club. The more starts he works, the more the bumps of the 2018 season will be in the rearview mirror. Leody Taveras, Rangers outfielder, Class A Advanced Down East: Speaking of lowered expectations, Taveras was ranked as MLB.com's No. 34 overall prospect at this time last year. He's since dropped out of the Top 100 completely after hitting just .246/.312/.332 with five homers in 132 games for Down East. While Taveras remains a plus runner and gifted defender, his bat has raised some questions, especially in the power department. Back in the Carolina League, the power isn't quite there yet this season, but everything else has been offensively. Taveras, who has hits in all eight of his games, is 14-for-30 (.467) with a triple, double and three stolen bases. That's certainly not sustainable -- he has a .737 BABIP in that span -- but that type of quick start should be a confidence boost for a player who needs one. Taveras will be 20 for the entire season, meaning he's still well on track for someone his age. Will Smith, Dodgers catcher, Triple-A Oklahoma City: There's no doubt that Smith, the organization's No. 6 prospect, entered the spring very much in competition to be the Dodgers' catcher of the future, mostly on account of his defensive work. His offense also has the potential to be solid, but he didn't show it in his limited look at Triple-A to end 2018. The Louisville product hit just .138/.206/.218 and struck out in 37.8 percent of his plate appearances over 25 games last season. He's starting to look more like the slugger who produced a 141 wRC+ in Tulsa before that. Smith has gone 6-for-18 (.333) with a homer, triple, two doubles and a 3/4 K/BB through six games back with OKC. One of those starts came at third base as he continues to get looks in the infield with Keibert Ruiz knocking on the door behind him at Double-A. A continued hot bat could keep him above his 20-year-old counterpart on the organizational depth chart for a bit longer. Tyler Beede, Giants right-handed starter, Triple-A Sacramento: The No. 23 Giants prospect's 2018 season was far from ideal. He gave up seven earned runs and walked eight in 7 2/3 innings over two Major League starts in April and could never get back to The Show on account of his 7.05 ERA and 1.86 WHIP in 74 innings at Sacramento. It's even rougher considering 23 of his 33 appearances in the PCL came out of the bullpen, where the Giants were hoping he'd find even some success. However, things have made a 180-degree turn since the calendar flipped. Beede was one of the standouts of the spring in Giants camp after simplifying his arsenal to a fastball, curve and changeup, and he's carried that back into the Sacramento rotation. Beede has allowed just one earned run over his first 7 2/3 innings while striking out 13 and walking five over his first two starts. Neither start was incredibly efficient -- he needed 79 pitches to get 3 2/3 innings on Wednesday -- but there's something to be said, of course, for striking out 38.2 percent of batters faced. Mike Soroka, Braves right-handed starter, Triple-A Gwinnett: On the field, Soroka has few worries. It's just the whole getting on the field part that's been an issue. Soroka was out from late June onward last season with shoulder inflammation and then developed a separate shoulder issue in the spring that limited him to three Grapefruit League appearances. That kept him from starting the season in the Atlanta rotation, but he's come out firing for Gwinnett. The No. 24 overall prospect tossed five perfect innings, striking out seven along the way, in his season debut with the Stripers. It was an accomplishment in itself that Soroka could show enough health to throw 49 pitches, and his efficiency in doing so only adds to the promise of what's to come from the Canadian in 2019.